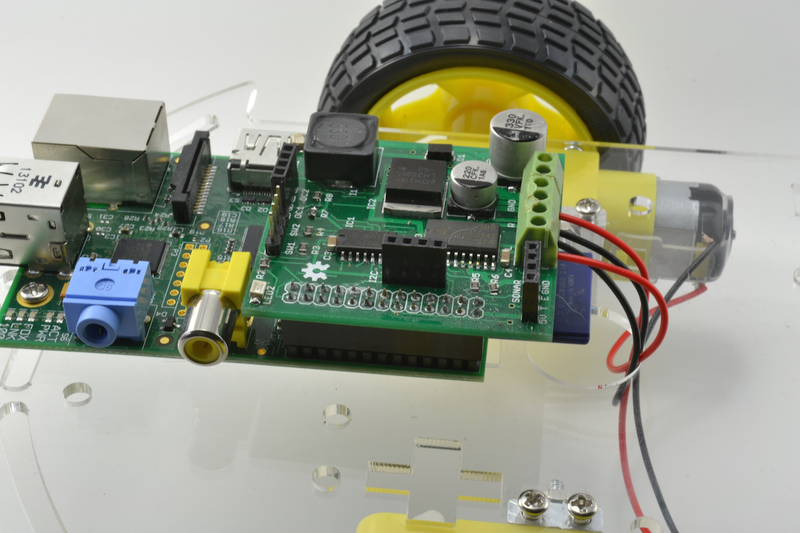 The RasPiRobot Board V2 is an expansion board designed to turn your Raspberry Pi into a robot controller! This board comes fully assembled and includes a switched-mode power supply so you can supply your Raspberry Pi from a variety of battery packs. The main features of version 2 are listed below. Version 2 of the RaspiRobot Board (RRB2) has learnt by the feedback from version 1 and it is a great improvement. The diagram below shows how an RRB2 board is used. The RRB2 is powered from a battery pack that needs to be between 6 and 12V DC. Although using 4 x AA batteries can in theory provide 6V, actually the battery voltage will usually quickly fall below that, so it it better to use at least 6 x AA batteries, either rechargeable or regular heavy duty batteries. A 7.2V LiPo battery pack will also work just fine. Note that you don’t need a separate power supply for the Raspberry Pi. The RRB2 will provide 5V at 2A with ease to the Raspberry Pi, and motors. Note that 6V motor will usually work just fine at 5V. Attach the RRB2 to your Raspberry Pi. You do not need to attach batteries, motors or anything else to the RRB2 just yet. For now you can just power it through the Pi’s normal USB power connector. 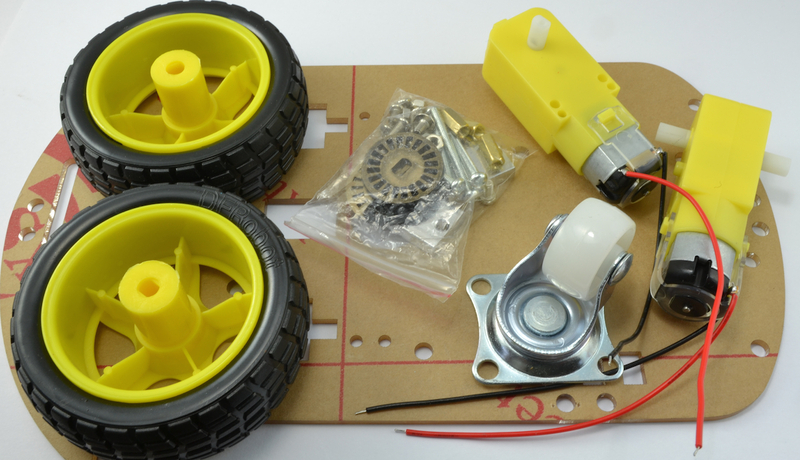 The quickest way to use the RRB2 as a roving robot is to buy a robot chassis such as the Magician Chassis (available from many sources) or similar low-cost robot chassis kits from eBay. These kits come as a laser cut body, a pair of gearmotors, often a battery box and nuts and bolts to fix it all together. Here is one such chassis. The first step is to bolt this all together. Note that these are usually supplied with a 4 x AA battery box. You will need to swap this for a similar 6 x AA battery box or a 7.2V LiPo battery pack. Rechargeable batteries are a good idea when driving motors. Once the chassis is built, use some of the bolts suppled to fix the Raspberry Pi on the chassis and then attach the RRB2 onto the GPIO connector. Make sure its the right way arround, and that all the pins meet up with the socket. The leads from the motors will thread up through the chassis and each pair of leads should go to one of the two screw terminals labelled L and R for (left and right). If you put the leads in the wrong way around, the direction of the motor will be opposite to that expected, so just swap them over if this happens. Next, make sure that your Raspberry Pi’s USB power lead is unplugged. From now on we are going to power it from batteries. WARNING: Never power the Raspberry Pi from both batteries and the USB power connector. One or other, but NOT both. It is a good idea to leave the wheels off the robot chassis for now so that it does not unexpectedly drive itself off your table. One or both of the motors may spin as the Raspberry Pi starts up. Wire the battery pack into the third pair of screw terminals. +V towards the outside of the board. The Raspberry Pi’s power light should light up and it will start to boot. LED1 and LED2 on the RRB2 will also light up. Having your Pi set up for WiFi will allow you to connect to it wirelessly over SSH. So, you may want to plug in a USB WiFi dongle. The library implements a class called RRB2. This is only available for Python 2 and any Python programs that you write that use the libaray must be run as a super user. I.e. To control LED2 just do the same thing but using setLED2. 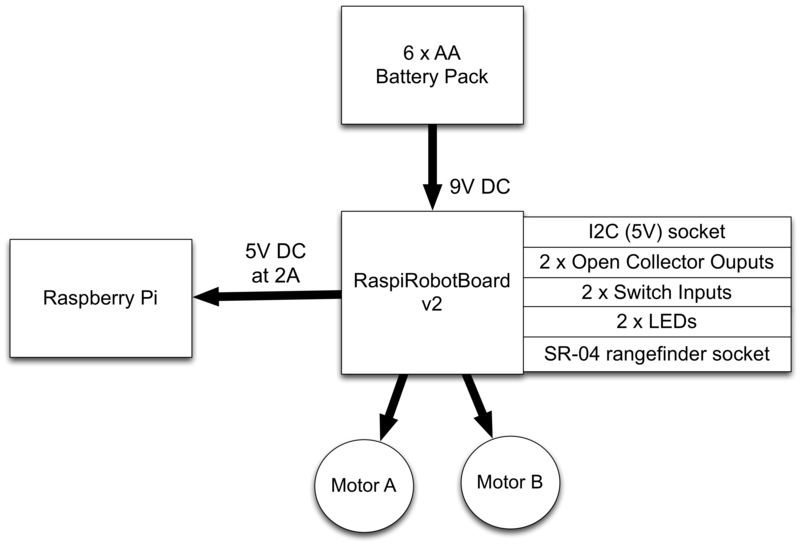 The RaspiRobotBoard has two low-power open collector outputs. These can each source up to 25mA and so are suitable for driving LEDs with series resistors. They can also be used to drive transistors and other external electronics. They are buffered and therefore protect the Raspberry Pi’ s processor. If you fit the RRB2 with an SR-04 ultrasonic rangefinder, then you can use the following call to measure the distance to the enarest obstacle in cm. The LEDs and OC outputs are buffered. The switch inputs are not. You can find the EAGLE design files in the “hardware” section of tis repo. Make sure that you plug the display in the right way around. The socket pins are labelled on the RRB2, make sure they match up with the labels on the display. You can use male to female jumper wires if you wish to put the display further away or its too big. Have a look in the “examples” folder of this library for some examples using the RRB2. Hi Simon. I was delighted to find this article. It’s opened a whole new vista for me, as hitherto I’ve concentrated on using Arduino boards. Hi Simon! I found the RaspiRobot Board V2 in researching how best to go about controlling a stepper motor. I am working on a project for my graduate degree, and have found myself in need of controlling 2 stepper motors. Is the board “stackable”, such that I would be able to control 2 motors, each by way of their own board? Will be updated for Pi2? In theory it should work anyway but we will be testing it out later today! Sorry for the delay (communications problems our end!!) but yes, it works!! is it possible to power the Raspberry and the RaspiRobot Board with two different battery (1 for rasp and 1 for motors) and bypass the 5V provided by the card ? With one battrey one many hours works the raspberry with 2 motors ? Hi Chris. One rather drastic way to do this is to snip off the 5V pins that go from the RRB2 to the Pi. Then you can use separate batteries, say a 5V USB battery pack for the Pi and an AA battery pack for the motors, although the motors will still use the regulated 5V from the RRB2. Assuming you leave the RRB as it is, a set of AA batteries holds about 2000mAh. If you say a Pi 2 uses an average of 300mA then thats about 6 hours worth. If the motors are on all the time, each using 300mA, then you will only get maybe 2 hours. 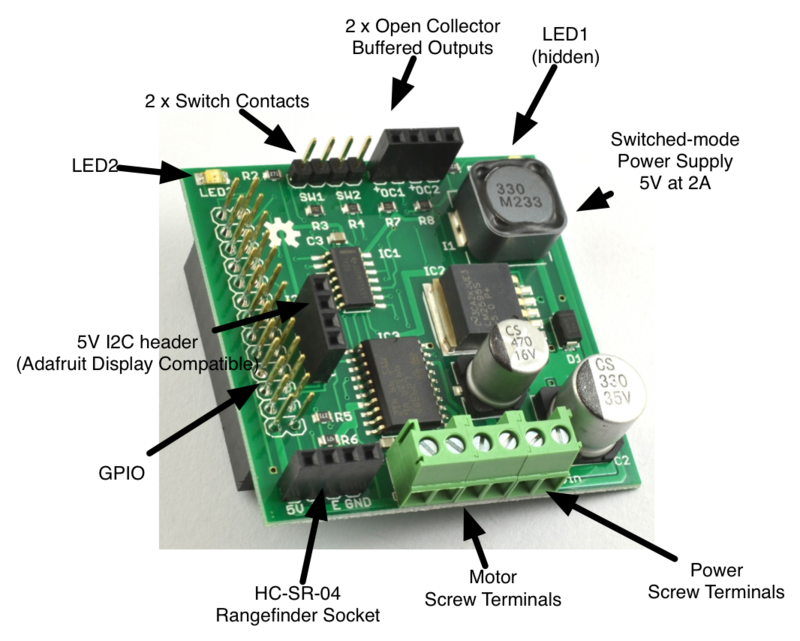 Where can I get a schematic for this and the “PhoBot – Robotics Shield for Photon” Schematic of which I own both? If you go to GitHub/simonmonk, look in repositories you will find both boards & the schematics will be listed under the Hardware section. Hi, excellent board, specially for beginners like me! Now I would like to now if it would be possible to add some python code to read data from wheel encoders. This would be in order allow to drive the robot in straight line. Currently I am using pwm to balance speed of motors in manually way, but it is not very precise. When do you expect this to be back in stock on Amazon.co.uk? Hi, that’s not something I have ever tried, but yes it should work. You will need to connect the two digital outputs from the encoders to digital inputs on the GPIO connector. As most of these are used by the RRB, you will probably need to use a Pi with 40 pin GPIO connector to find some free GPIO pins. As far as the code goes, to move forward straight, you will need to count pulses from both sides and if on count starts to get bigger than the other, reduce the speed of the motor that’s going too fast. Is there any way to make this work with python 3? I have a pi B with python 3 installed. If not, is there an easy way to install python 2 alongside 3 ? It will install the library for Python3. Thanks so much! I’ve had some other unrelated issues I need to work through first. But I will let you know how it goes as soon as I can. Thanks again! Hi Simon. Is There any datasheet for all the component that were used in the schematic board? If you google the part number followed by ‘datasheet’ you will find what you are looking for.